I apologize for being so absent for so long with these blog posts. Like many of you, the first three months were pretty rocky around here. I’m grateful for the hopeful earth that continues to push up green shoots even in the troublesome times. At the beginning of Lent, I began a daily series of inspirational posts at my other site, Community of the Incarnation. They were mostly related to the season of Lent, but I’ve decided to continue with less of an emphasis on the church year and more of an emphasis on simply living with a conscious intent. The posts are short, less than two hundred words, and focused on one idea. One of the things that happened to me in March was landing in the hospital for two days with something called Transient Global Amnesia, an interesting title and an interesting experience. In short, I’m fine, my brain is fine (well, sometimes that debatable) as is my heart. I simply shorted out. So I’m in catch-up mode. And careful mode. And really focusing on what’s important. In other words, simplifying. I’ll still post on this site, but less often, and probably more related to my writing projects. Or something. Life, as is so often said, is a process. I hope you’ll find me on the Incarnation site and join me for a few moments each day sitting still and re-collecting. I certainly need it. Maybe we all do. 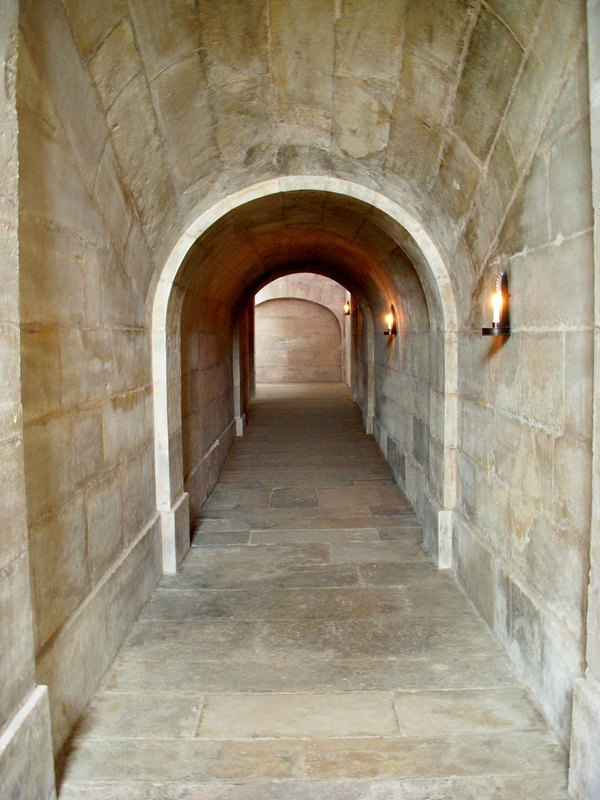 Lent’s a lot like this arched stone tunnel. You don’t know for sure where it’s taking you until you get to the end and turn the corner. Most of you know the saga of moving our big office into a little office so son could have the big office for a bedroom so I won’t go into that except to say that while Cliff and I work very well together, he’s needed more time on the PC for his online classes and I’ve needed a place to set myself apart and look out a window. It finally occurred to me to move my quiet writing corner into the bedroom. It’s a big bedroom. And we sleep here and dress here but that’s about it except it’s also my home gym. Which I use far less than I need to and which doesn’t take up much space. My epiphany was to bring one of the larger wooden TV trays and put it in front of a south-facing window near an electrical outlet, and here it is I’ve set up. My bedside table also works as a book stand; my laptop as both a writing tool and a research tool, thanks to wireless all through the house, and I even have room for a teacup. 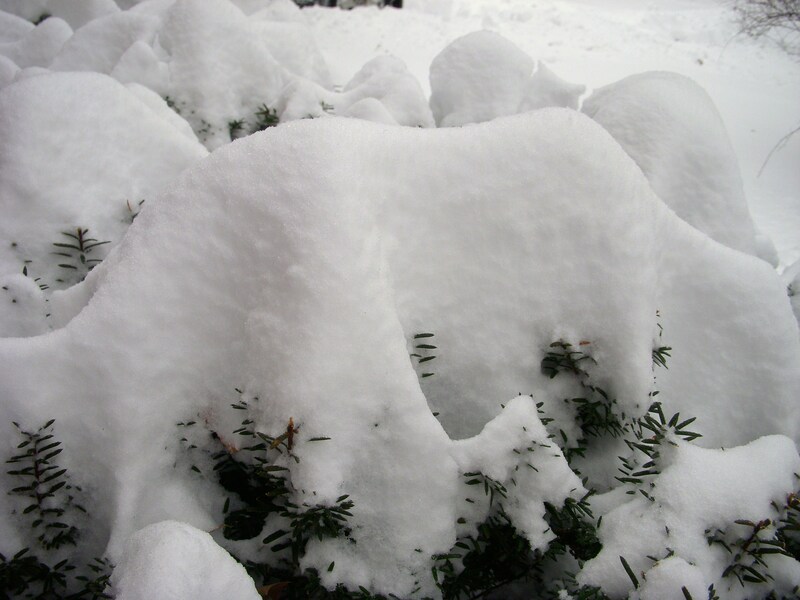 Today I’m looking out on about ten inches of snow and more to come. But with ten inches of snow, it’s pretty peaceful looking out there. My place in the world is peaceful and yet I’m surrounded by family. How good is that…. I finished revising an essay for publication since I’ve been here and I created a screenplay out of a short story I’d written a couple of years ago. I just like being here. It feels like a writing corner with far fewer distractions that in the official office. Funny how easy things are when you give up on things being the way you think they’re going to be and see how you can live with things being the way they are. So here’s the URL again for the Lenten readings in case you missed it last time: http://cotikc.wordpress.com. May all your days be as peaceful as an empty stone hallway, or an undisturbed drift of snow, before you make that turn into whatever is there, ahead. What do we mean when we use the word soul? What is the indescribable quality we intend to convey? Humans have souls; music has soul; summer’s soul now slips into quiet sunsets. In The Meaning of Meaning, a seminal book on language and thought first published in 1923, C.K. Ogden argues that words, in themselves, have no meaning. Rather they are symbols of thought. Oh! Of course: why hadn’t I thought of that – me, the curious seeker who turns to her American Heritage Dictionary for entomological insights whenever possible. I’d searched for meaning, but without realizing I’d also searched for thought. My actions led me to thought but my thinking named it meaning. It’s like reality: reality is what we are taught to see and taught to name and in that naming make sense of the unknown. But if words are only symbols of thoughts, we’re still rambling in the shadows. Take hummingbirds, for example. They’re a pretty concrete, abet fast, reality. Last evening, as I sat on the back porch, a hummingbird zipped past. They don’t often come this close to the house – I’ve put the feeder back in a shaded corner where some white, sweet-smelling flowering vines tumble over the fence from the neighbor’s yard. But this evening, one of them came across the yard for a brief hello. In Mexico, where I once lived, an Aztec myth said that when a warrior dies, his soul becomes a hummingbird. And I wondered at the thought process that made a hummingbird the soul symbol for the people of Mexico. I remember standing outside one evening, watching across a gully to another hillside as the sun disappeared from the arc of horizon. A hummingbird zipped up and circled me, flitting from red bloom to red bloom on my silk dress. Mistaken for a flower as the fabric ruffled in the breeze, I froze, not wanting to betray my own humanness. The hummingbird inspected me, zip, zip, zip, all around, coming to pause for half a moment of fierce inspection in front of my face. I still didn’t move although I did feel delighted in the other-worldly sort of tap on the shoulder. That same curiosity and fierceness seems to characterize the hummingbirds in my yard here in Kansas City. Here, they like perching in the willow. Perhaps because even while sitting still, they’re still able to move with the breezes. But they’re also territorial. If a cardinal or finch comes to sit and admire the graceful drift of a willow branch, the hummingbird will dart at them and drive the intruder away. Dart; dart; Leave!! But I was not an intruder as I sat in my screen-sheltered porch. I’d gone to sit and ponder this journey I have no name for and the struggle to find the words to frame it. What was I to learn from this visit? Perhaps that a warrior defies the odds, regardless of the challenge. If I do not have the words today to define my passage, I may tomorrow. If I am bowed by the responsibilities of writing, I will ride a new wave tomorrow. Or the next day. If that’s a warrior’s soul that’s come to visit, perhaps I could say that defeat isn’t an option. That whatever the challenges, the answer is again and again and again to keep going, darting or inching, to the answer or resolution. And perhaps that’s the reality of souls: unwilling to give up, willing curiosity, willing courage.